26 1/2 x 20 3/8 in. In the late 1950's, Jasper Johns emerged as force in the American art scene. His richly worked paintings of maps, flags, and targets led the artistic community away from Abstract Expressionism toward a new emphasis on the concrete. Johns laid the groundwork for both Pop Art and Minimalism. Today, his prints and paintings set record prices at auction. 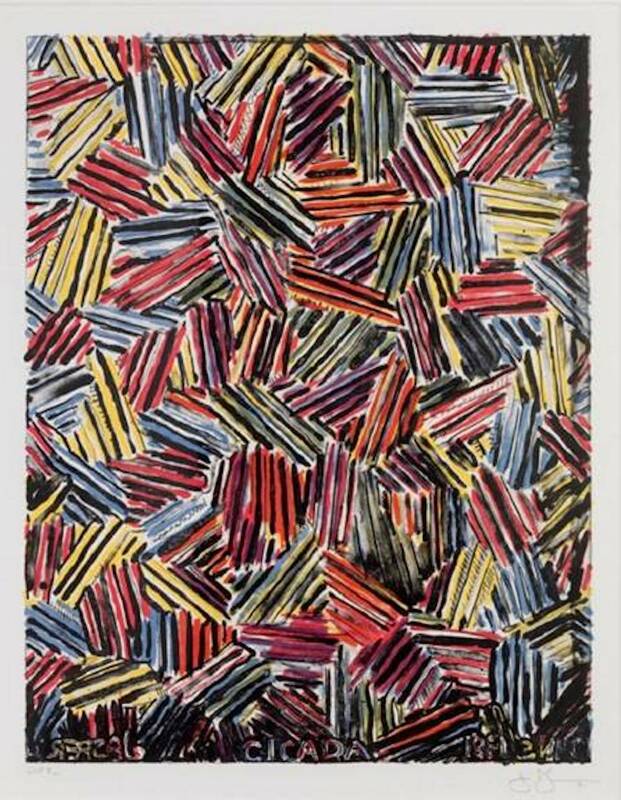 Born and raised in Allendale, South Carolina, Jasper Johns grew up wanting to be an artist. He studied briefly at the University of South Carolina before moving to New York in the early Fifties. After a visit to Philadelphia, with his good friend Robert Rauschenberg, to see Marcel Duchamp's painting, "The Large Glass" (1915-23), Johns became very interested in his work. Duchamp had revolutionized the art world with his "readymades" — a series of found objects presented as finished works of art. This irreverence for the fixed attitudes toward what could be considered art was a substantial influence on Johns. The modern art community was searching for new ideas to succeed the pure emotionality of the Abstract Expressionists. Johns' paintings of targets, and maps, invited both the wrath and praise of critics. Johns' early work combined a serious concern for the craft of painting with an everyday, almost absurd, subject matter. The meaning of the painting could be found in the painting process itself. It was a new experience for gallery goers to find paintings solely of such things as flags and numbers. The simplicity and familiarity of the subject matter piqued viewer interest in both Johns' motivation and his process. Johns explains: "There may or may not be an idea, and the meaning may just be that the painting exists".